Lewis Hamilton knows better than to get too carried away with Sunday's victory at the Spanish Grand Prix. The defending Formula One world champion was at his imperious best as he won by 20 seconds from Valtteri Bottas in a welcome one-two for Mercedes. Sebastian Vettel won two of those three opening races as Ferrari threatened to mount a serious challenge to Mercedes' dominance of the sport over recent seasons. 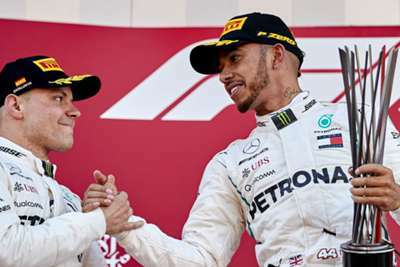 Bottas' late retirement in Baku handed Hamilton his first win of the season on a plate - a result that edged him ahead of Vettel in the drivers' standings for the first time this term - and he followed that up with Sunday's impressive performance. But despite his growing confidence and an increased "synergy" with the car, Hamilton was careful not to overstate the significance of his second successive win. "It's obviously a little bit early to say but I would like to hope that it could be part of a turning point," he said. "Race by race we're understanding the tyres more, which is a bit battle for everyone. We could just as easily go to the next race and struggle getting our tyres working and be nowhere. So, it's a little bit early to say. "We do after the five races now have a much, much better understanding of the car, of what we need to do to get the car to be working – but we still have learning to do, improvements to be made. "We still need to add performance to the car throughout the year, so that's what we're going to be continuing to be working on."